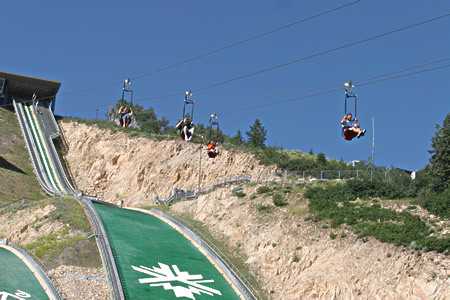 Utah has built one of the steepest ziplines in the world. No kidding the experience will be that of an Olympian flying off the K120 Nordic ski jumps. Just one more reason you will want to come Utah an experience you will never forget! The rates are very reasonable at $20.00 per ticket they also have group discount rates. •	The Extreme and Freestyle ziplines are available on a first-come-first-served basis during the operational listed hours listed below. •	The Extreme and Freestyle ziplines are closed during the winter season. •	Exclusive sessions available year round outside of public hours of operation. Utah one of the best places to vacation bar none!! !